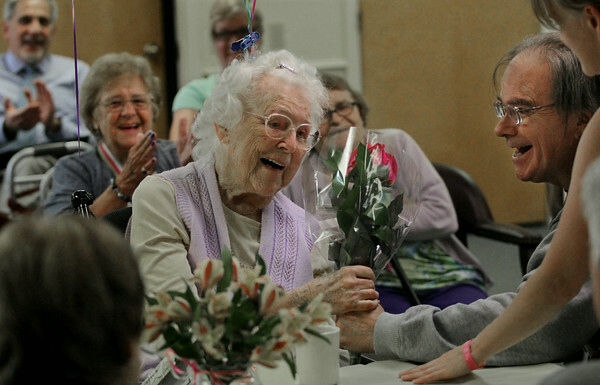 Alice Brayman receives a rose from friend Bill Grandmont during her 100th birthday party Friday at the Day By Day Adult Care center in Gloucester. Brayman was born in Gloucester in 1914 and has lived here her entire life. State Senator Bruce Tarr attended the party to read an official proclamation in her honor. A birthday card to her from Barack and Michelle Obama was read out loud, and various friends stood up to speak.